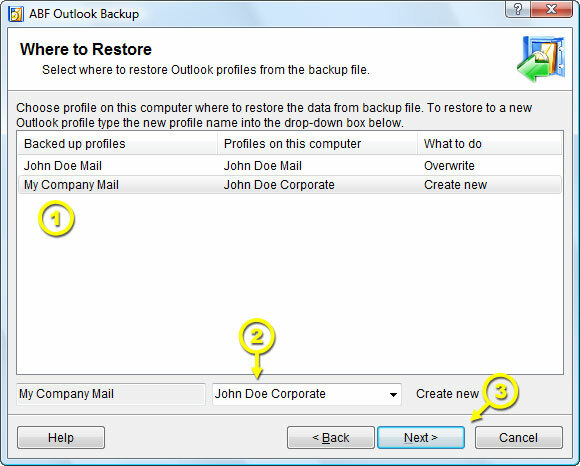 On this step ABF Outlook Backup offers you to choose profiles to restore your data to. You can restore into existing profiles or create a new one with the program directly. Figure 17. Where to restore. First select a profile from those you have chosen to restore (Figure 17; Pos 1.). If you want to restore into existing Outlook profile chose one from profiles combo-box (Figure 17; Pos 2.). You will see Overwrite under What to do section of this profile. If you want to restore into a new Outlook profile, type its name in profiles combo-box (Figure 17; Pos 2.). You will see Create new under What to do section of this profile. Repeat this action for each profile you are restoring. After that click Next (Figure 17; Pos 3.) to proceed to the next step.